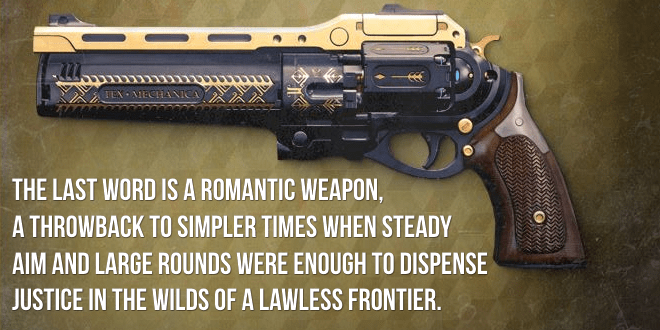 The Last word is an Exotic hand cannon. Compare the Exotic hand cannons here. The good: Super fast RoF & full auto. The bad: PvE utility is minimal. Conclusion: Still one of the best 1v1 PvP weapons. The weapon can be fired quickly and continuously. This weapon has bonus accuracy while firing from the hip. Bonus damage and stability. Extra precision damage when firing from the hip. This weapon has extremely low recoil. The Last Word has been around the block a few times. It was once one of the premiere PvP weapons but it fell in 2.0 when Hand Cannons were nerf’d. Inconsistent shot placement and inscrutable range made it a chore to reacclimatize to, and the rise of EZ-Mode Pulse Rifles like Hawksaw and the PDX-45 provided versatile alternatives with near-comparable TTKs. Now, Bungie’s latest salvo of tweaks to weapons and Exotics has thrust it back into the spotlight, and prompted the need for an updated review. As we’ve pointed out before, for unique weapons in Destiny, statistics don’t mean too much. The Last Word defies archetype, so the RoF, Impact, Stability, and Range numbers mean very little when comparing it to other Hand Cannons. This section will be used to give an overall impression of how the gun feels and performs, and where you’ll notice shortcomings and strengths. You’ll notice immediately that this weapon puts out intense DPS. The fully-automatic, lightning-fast RoF makes use of above-average Impact damage from an eight round magazine, depleting it faster than any other Hand Cannon in Destiny. If you don’t pace your shots, the ADS kick attests to the poor base Stability, though with hip-firing it becomes manageable with a heavy thumb. Base Range is very tricky to assess in the most ideal situations; suffice to say that it’s designed for CQB and you’ll be frustrated if you try to push it into medium-range engagements. As you chew through rounds, you’ll deplete your reserves quickly, so expect both a lot of reloading and a lot of scrounging for ammunition. Aim Assist-wise, this weapon can be forgiving, but just as often will be infuriating as a shot you swore you hit somehow misses wide or high. 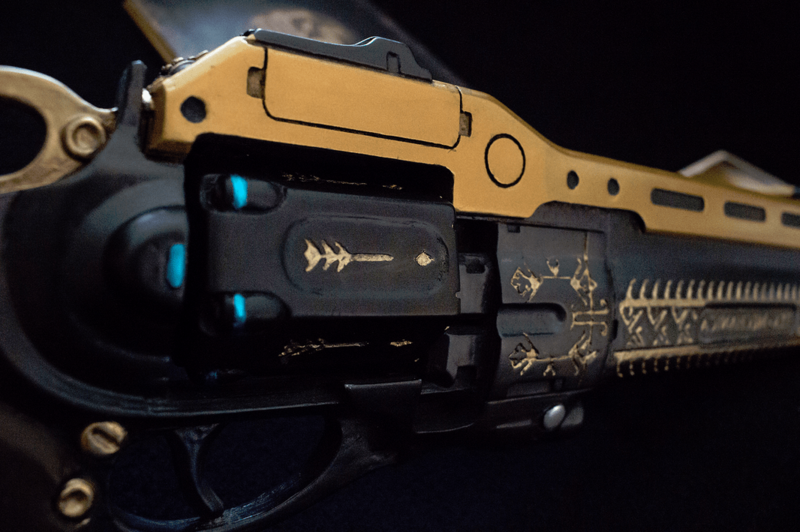 The intrinsic perk Fan Fire makes The Last Word unique among Hand Cannons as a true Gunslinger’s weapon. While you are able to sample semi-automatically, you aren’t embracing Tex Mechanica’s design unless you hold that trigger down and watch your foes melt before your eyes. Of course, it’s a bit of a double-edged sword when it takes longer to reload than to empty your magazine. If your first thought is “well, I’d better make each mag count”, then you’re on the right track. The first row ballistics are a hotly contested debate among TLW enthusiasts. On any given thread, you’ll find an impassioned advocate for Aggressive Ballistics, Soft Ballistics, or Smart Drift Control. Most of these arguments are rife with anecdotal testimony, so it’s no simple matter to determine the best one. The best advice we can give you is to opt for Aggressive Ballistics if you’re proactive about taking recoil and range into your own hands, and want that extra damage. If you prefer to eke out every last bit of Range, Soft Ballistics is your best bet. Finally, Smart Drift Control throws a leash on that unruly kick and is ideal for players who are not shy at all about getting right in the face of their enemies. 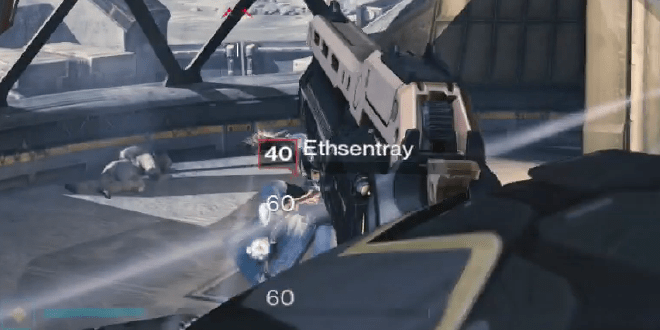 Then there’s Hip Fire, granting increased accuracy when firing from the hip. While “accuracy” has been revealed to be a rabbit hole of a stat encompassing a whole bunch of hidden factors, just know that this perk will make it noticeably easier to land hits reliably even without the benefit of ADS. This allows you to be mobile, have a stronger visual command of the battlefield, and — most importantly — to take advantage of TLW’s eponymous Exotic perk. First, though, we have to consider the middle column. Single Point Sling ups your ADS movement speed while also offering a buff to weapon swap times. It’s the best option if you frequently use TLW to finish weakened targets in PvP or rely heavily on your Special Weapon in PvE. High Caliber Rounds is interesting in theory, but harder to abuse when you only have 8 rounds with which to take advantage of it. There’s some evidence that it makes it more difficult for opposing Guardians to return fire accurately, but without a proper test, there’s no way to confirm this. Your final option, Perfect Balance, is perfect to bolster the recoil control. It pairs well with Soft Ballistics, and in general is a risk-free improvement to an already solid gun. Of course, if you can wrestle the recoil down yourself, Single Point Sling is our recommendation. The Exotic perk offers non-specific increases to “damage and stability” but the real noticeable bonus here is the buff to precision damage when firing from the hip. This is where Hip Fire comes in. In order to become fearsome in PvP, TLW users will have to become accustomed to learning to score their kills while firing from the hip. The buff helps to compensate for the nerf TLW took to its ADS damage numbers. It’s not easy to shake the habit of aiming down sights for kills, but The Last Word is not a weapon for creatures of habit. As you rack up the kills with Fan Fire hip-shots, you’ll start to appreciate the awareness this weapon affords you. More importantly, managing the hipfire recoil and learning where your bullets go will become second nature. Normally we’d devote a proper section to a weapon’s viability in PvE, but this weapon just doesn’t deserve it. This gun was designed to dominate the Crucible, and taking it into PvE is a frustrating proposition at best. The miserable reserve ammunition count, base Range, and lack of any reload speed boosting perks combine for a triad of condemnation that declares TLW basically off-limits for PvE. If you do decide to give it a shot, you’re best off inverting roles with your Special and Heavy, and only using The Last Word to lock down and kill harder enemies at close range. As Patrick rightly notes, it’s just too hard to take advantage of its DPS with Fan Fire, and if you’re compensating by firing more slowly, then there’s no reason you shouldn’t be using a normal Hand Cannon anyway. This is where The Last Word still holds serve as the Primary Weapon to beat. 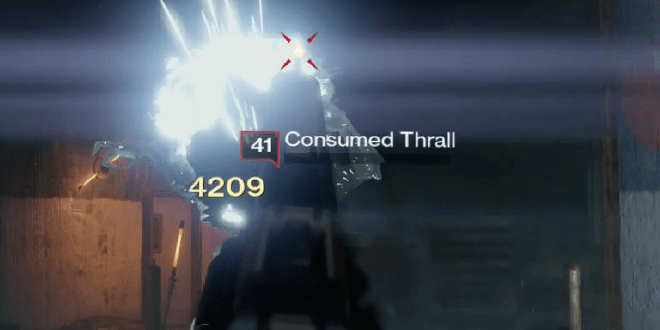 In a close-to-medium range, fastest-TTK-takes-all metagame, this Hand Cannon seems designed to dominate. While it once was basically required to have any success (this author will shamefully admit to using it to grind out Rumble wins), it is now not quite as ubiquitous; however, it is still every bit as deadly in the right hands. The key to success with TLW these days is to really become adept at getting your hipfire kills. There are a few tricks to reliably landing shots, including snapping from ADS to hipfire just as soon as you land the first bullet – but skill with this weapon will only come with experience. Once you have this experience, prepare to enjoy putting your opponents on their heels. While TLW doesn’t have the unholy range it once did, as Shotguns have retreated into their shells, it’s free to wreak havoc in close range yet again. You’ll catch chargers and too-bold Guardians alike out in the open, and then it’s a matter of half a second and they’re dead not knowing what hit them. With Aggressive Ballistics, the dreaded two-headshot kill is technically possible, but it requires two consecutive hipfire headshots – no easy feat in conventional Crucible play. Even if you miss your ideal TTKs, the mobility you’re afforded (both lateral and vertical) makes you a hard and unpredictable target for Guardians wielding conventional weaponry. While they attempt to ADS and re-position, you can pepper them with high-accuracy fan fire from a position of strength. The Last Word is an ideal ambush weapon, and rewards players who are equal parts confident and aggressive. Still, there’s a reason the top players use The Last Word: it makes the perfect partner for a Sniper Rifle. With Single Point Sling, a Sniper who lands a body shot can quickly swap and drop before an opponent has time to react and counterattack. Between the two weapons, the conventional engagement distances are covered, and TLW and Snipers patch up each others’ weaknesses very well. The Last Word is still the same imposing, gorgeous Hand Cannon that it’s always been – stylish gun flip intact. The compact power of eight rounds exiting the magazine still rings out with a satisfying pop, and there’s something viscerally satisfying about savoring the rhythmic rate of fire interspersed with two frantic seconds of reloading. Even with much-needed nerfs, it’s still a beast that even Bungie probably didn’t anticipate would be so resilient. While offering no new benefits to PvE players, the recent improvements to Hand Cannons have renewed its membership as Crucible Threat Extraordinaire. If you slap on a pair of Hand Cannon Reload Speed+ Gauntlets, not much can stand up to you and escape unscathed. Whether or not TLW’s particular brand of deadliness is long for the meta will come down to its esteem and usage in the eyes and hands of Destiny’s Guardians. Pick it up and you’ll see what all the fuss is about. For PvP this weapon earns a 9.5/10 and for PvE a 5/10.